Check out these five designer dogs if you are looking for something unique but just as lovable as any AKC-recognized breed. If you haven't heard of these mixed breeds yet, you will soon. These adorable mutts are spreading like wildfire. The American Canine Hybrid Club recognizes well over 200 hybrid dogs, many of which are rarely heard of. A few of these designer breeds are better known than others and have become very popular to own. Many people actually feel that designer breeds are healthier than purebred dogs while others strongly disagree. Once you have done your research on the benefits and problems of designer breeds, you may decide that one of these unique pets is just what you've been searching for. This list of five popular designer dogs will help you get started on your search. The Puggle is a cross between a Pug and a Beagle. Almost too cute for words, Puggles have quickly worked their way into the hearts of many since they were first developed in the 1980s. With an adult weight between 15 and 25 pounds and 10 to 15-inches tall, Puggles are playful little companions that get along well with children. Their short coat can be fawn, tan, black, white or tri-colored. Grooming is minimal with only a regular bath, nail clipping and ear cleaning needed. Puggles are easy to train, love to snuggle, happy and playful. This makes them a good choice for a growing number of families. They can even be trained to use a litter box. They come in three sizes. Standard is 23 to 26 inches tall and 45 to 77 pounds depending on if the dog is male or female. Mediums are 18 to 21 inches tall and 40 to 55 pounds. Miniatures are 14 to 17 inches tall and 26 to 55 pounds. This hybrid is a mix between a Golden Retriever and a Poodle. First bred in the 1990s, Goldendoodles are similar to the Labradoodle in that they are often selected by families with allergies because they do not shed very much. 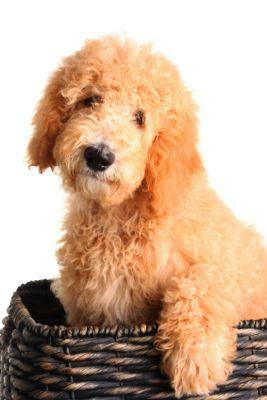 Goldendoodles can have a curly or wavy coat in the same colors as the Labradoodle. They also come in the same range of sizes. Friendly, easy to train, intelligent and of a moderate energy level, Goldendoodles also make excellent service dogs and family companions. Adults get from 12 to 13 inches tall and weigh 10 to 20 pounds on average. A Chihuahua/Yorkshire Terrier cross is known as a Chorkie. Chorkies are intelligent and trainable, and many of them learn tricks along with their basic obedience training. These little dogs are good for people who live in apartments because they have minimal exercise requirements, and they often get all they need with a daily play session indoors or out. Chokies do like to bark and may act aggressively toward strangers if not properly socialized. Families with small children are not recommended for Chorkie ownership because they are small and can be hurt unintentionally by an over-eager child. These five popular designer dogs are just the tip of the iceberg! With so many hybrid dogs available, you are sure to find one who is the perfect fit for your family and lifestyle.